Venus continues to brighten in the western sky after sunset this month. It’s caught under the feet of the constellation Gemini in the northern Milky Way not far from the splendid open star cluster M35 at mid-month. A pair of binoculars shows both in the same field of view. 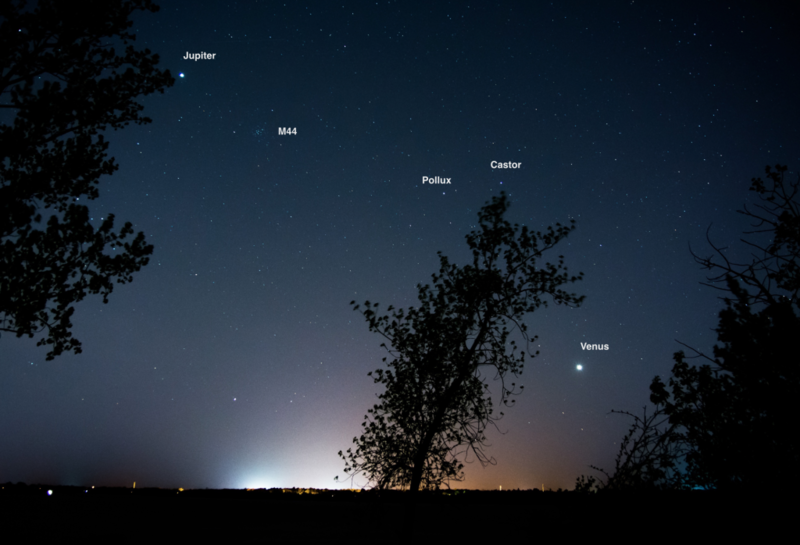 The bright planet reached its highest point above the horizon on May 8 and now slowly moves back towards the horizon each night on its way to an extremely close and photogenic encounter with Jupiter at the end of June. Venus setting (lower left) amid light pollution (the orange color at left) and a faint red auroral display (right). If you can, have a look at Venus with a telescope during the month. The planet is perpetually shrouded in cloud, so you’ll see no surface features. But you will see the face of the planet grow larger and less illuminated each day. At the beginning of May, Venus is about 16″ across and 2/3 illuminated. By month’s end, the planet grows to 22″ across and becomes half lit. Into June, July, and August, the planet’s visible face become larger and crescent shaped. Unlike Mercury, Venus grows brighter as it catches less of the Sun’s light simply because it gets closer to Earth. By the end of May, Venus reaches magnitude -4.4, nearly 16x brighter than the brightest star in the sky, and bright enough to cast faint but razor sharp shadows on a dark night. It will be easily visible in the daytime sky in a telescope or binoculars if you know exactly where to look… or if you have a go-to mount to help you find your way.